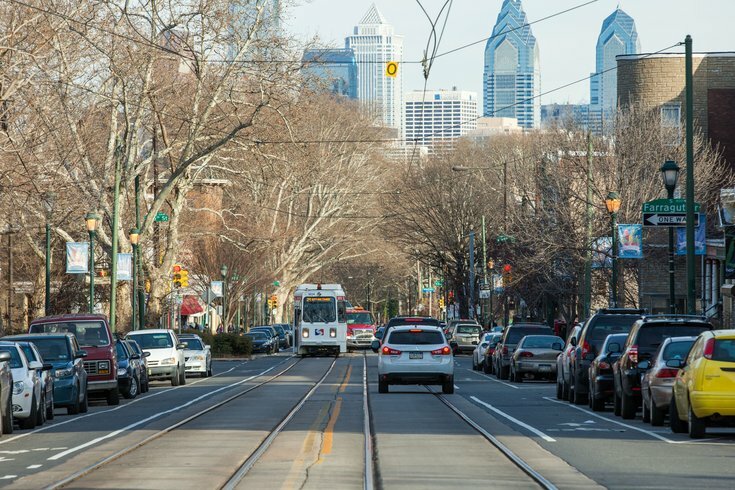 A trolley rides down Baltimore Avenue in West Philadelphia. Several dozen people received treatment for injuries Wednesday after two of SEPTA's Route 10 trolley cars collided in the Powelton section of West Philadelphia. SEPTA officials said the collision occurred around 1 p.m. near the intersection of 38th Street and Lancaster Avenue. Both trolleys were traveling westbound to 63rd-Malvern, one of them at rest, when the second car rammed into the rear of the one ahead of it. Forty-six people, including two trolley operators, were reported injured in the collision. SEPTA provided buses and EMT support to transport those injured for further evaluation. Officials said all of the injuries appear to be non-life-threatening. Philadelphia's Accident Investigation Division responded to the scene and both trolley cars were removed from the tracks. It was not immediately known whether miscommunication or the trolleys' rates of speed were directly responsible for the collision. There was also no indication that the location of the collision is particularly dangerous, officials said. Route 10 trolley riders have been advised to anticipate some delays as cars were diverted to maintain service in both directions. Rte 10: UPDATE: Trolleys remain on diversion to 40th and Filbert. Passengers may board the MFL to 40th Street for connection. Rte 10: Currently there is no service between 36th an Market and 38th and Lancaster.